This contemporary wall mounted toothbrush holder is made of chrome on brass with a glass inner cup for easy cleaning. Each tooth brush holder can be screw wall fixed or with screwless self-adhesive fixing, which is ideal for very hard tiles or expensive wall coverings. 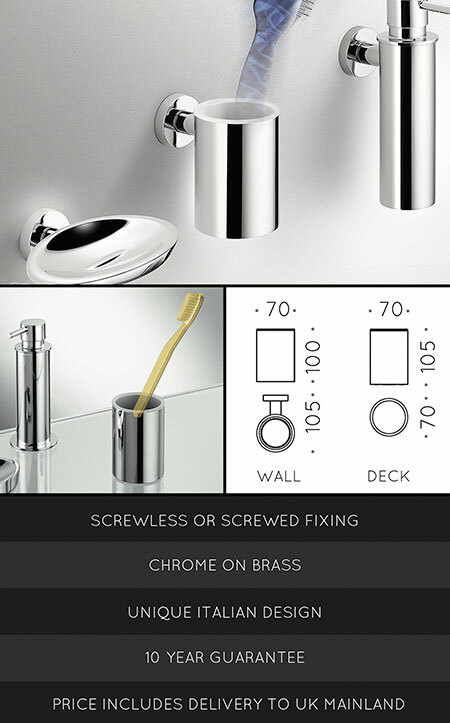 Made of corrosion free brass with chrome plating and supplied with 10 year guarantee. * Best quality on the market. * Chrome with inner glass cup.